Posted by geoconger in Church of England Newspaper, EKD. The Rt. Rev. Heinrich Bedford-Strohm, Bishop of the Evangelical Lutheran Church in Bavaria has been elected head of the Evangelical Church of Germany (EKD). On 11 Nov 2014 the EKD council meeting in Dresden elected Bishop Bedford-Strohm on the first ballot. The Bavarian bishop received 106 of the 125 votes cast. He succeeds Nikolaus Schneider, president of the Evangelical Church in the Rhineland (EKiR), who served as acting president following the resignation of Bishop Margot Käßmann in 2010 following her arrest for driving while intoxicated. The President of the EKD Synod, Irmgard Schwaetzer, welcomed the election stating the new bishop would unite the church in the face of challenges from Germany’s growing secular culture. “Heinrich Bedford-Strohm now has a clear mandate to bring the remaining tasks of this council term to their conclusion.” She added the council can give now give its full attention to “the preparations for the 2017 Reformation anniversary”. 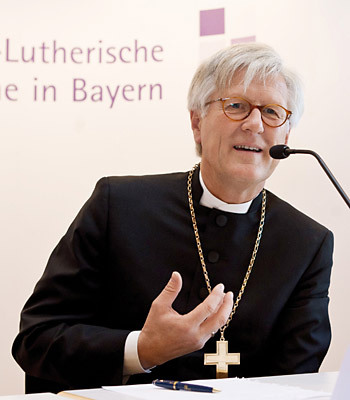 Born in Memmingen in 1960, Bedford-Strohm has been the Lutheran bishop of Bavaria since 2011 and previously served as Professor for Systematic Theology and Contemporary Theological Issues at the University of Bamberg, following positions in pastoral and diaconal work.